Yesterday we posted the first part: The True Story of Mary Cook, Part I. Today we present Part II, which includes the harrowing story of Mary’s rescue from the sinking SS Central America. 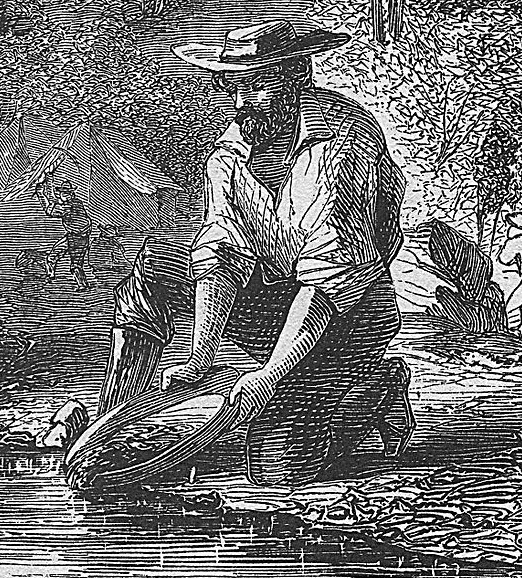 Illustration: man panning for gold in the California gold fields. Credit: Wikimedia Commons. 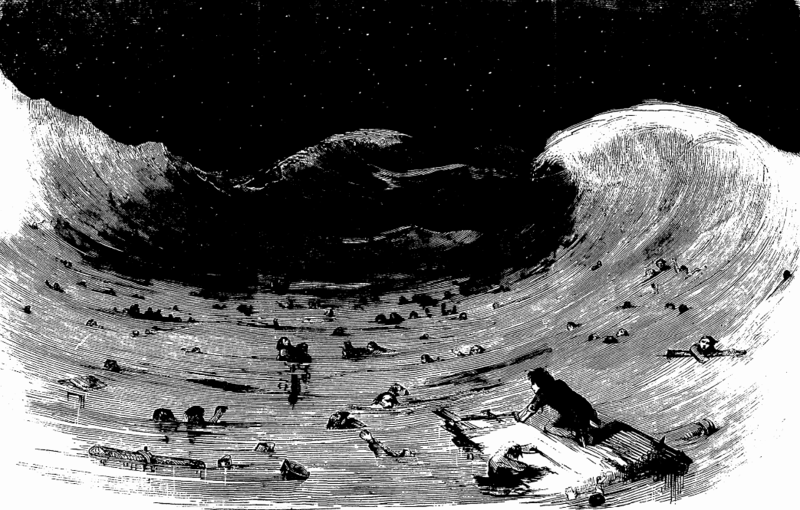 By the summer of 1857, Mary’s husband Samuel Swan had managed to accumulate about $10,000 of gold dust and coin in the California gold fields. That’s about $275,000 in today’s dollars – a very nice nest egg, indeed. He longed to head back east and see his family in Pennsylvania. Neither Sam nor his wife were anxious to make another slog back east by wagon train, especially with a baby girl not yet two years old. Fortunately – or, in retrospect, unfortunately for this young family – the explosion of growth in California and the need to get the valuable gold in the coffers of the banks on the East Coast resulted in the establishment of a fleet of steamships that cut the trip from coast to coast from six months to a little under four weeks. Sam, his 17-year-old bride of less than two years, and baby Lizzie boarded the steamship Sonora in San Francisco on 20 August 1857, bound for Panama City. The price per ticket in steerage, the lowest class, was about $150 per person. The Sonora arrived in Panama City two weeks later on September 2. A narrow-gauge railroad line across the 47-mile isthmus had recently been completed. A trip that used to take several days by wagon and foot through mountainous jungle was made significantly shorter and easier by the opening of the Panama Railway. They climbed on the train and made it to Aspinwall on the east coast of Panama a few hours later that same afternoon. On September 3, they boarded the SS Central America (formerly known as the George Law), commanded by Captain Wm. L. Herndon, for the seven-day trip to New York City. There were 596 on board: 491 passengers, including 32 women and 28 children; and 105 officers and crew. Most of the male passengers were miners, like Sam, returning to their home states. Sailors in those days professed it bad luck to rename a ship. The fact is, the vessel was named after its principal builder and part owner, George Law. Law had recently sold his stake in the ship to his partners and it was he that insisted the name be changed. Captain Herndon, 43, had spent his entire career at sea since age 15. There was no Naval Academy or other similar education opportunities to learn to become a boat captain. Training was through several apprenticeships on different ships and voyage assignments that could keep a young man away from home for one to three years. Herndon was an able sailor, natural leader and intellectually curious. One of Herndon’s assignments involved being the first non-native to explore the Amazon River valley starting in Lima, Peru, in the Andes Mountains and traveling through Brazil to the Atlantic Ocean. His exploration party traveled over 4,300 miles. The two-year adventure and the 400-page book he wrote about it, Exploration of the Valley of the Amazon, earned him worldwide praise and acclaim. Herndon married Frances Elizabeth Hansborough of Virginia in 1836. Their only child, Ellen, was born the following year, two years older than Mary Sawyers Swan. Ellen was praised for her beautiful singing voice, although she never sang professionally. Herndon assumed command of the 278-foot steamer SS Central America in 1855 and had several round trips from New York to Aspinwall under his belt. In addition to passengers, the Central America carried $1.6 million of gold bars and coin (worth over $150 million today) desperately needed by East Coast banks to prop up their capital. It was estimated that the gold on the ship represented 20% of all the gold held in the banks’ vaults on Wall Street. This didn’t include the copious amounts of gold carried by the passengers. The Central America had three decks. The first- and second-class cabins were located aft in staterooms situated on both the second and third decks, and were occupied by 159 persons including 24 women and 27 children. The 332 steerage passengers were carried forward on the second and third decks in three-high tiers of double bunks anchored against the sides of the ship. There were eight women and three children travelling in steerage, including Mary and baby Lizzie. The Central America enjoyed fair weather and smooth seas, and arrived in Havana on Monday, September 7. The passengers did not go ashore. Cuba was riddled with the deadly Yellow Fever disease. The next day Captain Herndon set sail and steam for New York City. The smaller and slower sister steamship, Empire City, commanded by Captain McGowan, left Havana later that day, also bound for New York City. The wind began to pick up on Wednesday and by Thursday, September 10, the Central America was battling an intense hurricane with ferocious winds producing 30-foot waves. At this point the ship was about 75 miles off the southeast coast of Florida. Flooding swamped the bottom deck-steerage where Mary and Lizzie were riding out the storm in one of the top bunks. As the ship was tossed by mammoth waves, Mary was thrown from her bunk onto the wooden floor and severely bruised. The flooding extinguished the coal- and wood-burning fires that drove the steam-driven engines and paddlewheels. The Central America’s sails were ripped to shreds by the hurricane’s winds and she lost her forward mast. By noon on Saturday, September 12, Herndon realized the ship could not remain afloat much longer. He flew distress flags and fired rockets to attract attention of any nearby ships. In those days there was no radio, wireless or any other form of communication. At 1:00 p.m. the brig Marine, Captain Hiram Burt commanding, spotted the Central America in distress. Using a speaker horn (like one of those orange traffic cones), Herndon shouted to Captain Burt to standby and prepare to help with rescues. Although the wind had abated some, the sea was still boiling with monstrous waves. The Marine had also been damaged in the storm and was barely seaworthy. Herndon couldn’t tie off his ship to the Marine because he had lashed all of his hawser lines around broken-off masts to create drag in a desperate attempt to keep the Central America pointed into the wind. Those efforts failed. The lifeboats could only take a few passengers at a time because of the rough seas. The wind was blowing the Marine and its skinny crew of 15 further away from the Central America by the hour. These boats were powered only by the arms and backs of sturdy sailors. It took the first boat about a half hour to reach the Marine. The boat that made the ninth and final trip reached the Marine in two and one-half hours. Captain Herndon and his officers maintained control and discipline, and only had to discourage a few of the men from jumping into the lifeboats. When the lifeboats finally reached the Marine, Captain Burt devised a way to get the women and kids out of the boats into his. They would wait for the enormous waves to lift the boats up close to the Marine’s deck, thus enabling Captain Burt and his sailors to reach down and grab the arms of the soaked and terrified women and children. He lashed Lizzie on Mary’s back, kissed them goodbye, and returned to the pumps. That was the last they saw of him. When Mary’s lifeboat arrived at the Marine, Captain Burt and crew tried three times to hoist her and Lizzie into the boat. Each time they lost their grip and the pathetic pair plunged into the sea. Mary’s battered body and the additional weight of her baby and money belt no doubt contributed to the difficulty. However, the fourth try was a success and Mary and Lizzie were brought safely aboard; “safely” a relative term because no one on board the Marine was out of danger – far from it. During all this time the men on board the Central America continued their bailing efforts, most reaching a point of total exhaustion. Once all the women and children were safely aboard the Marine, Herndon permitted the male passengers to begin boarding the lifeboats. This process was less disciplined with several passengers and crew leaping into the boats or into the water to be picked up. Forty-nine men made it to the Marine. Samuel Swan was not one of them. The last moments on the Central America were relatively calm. Resignation set in that no more lifeboats would be returning from the brig Marine, now blown more than eight miles away. The lifeboat crews were beyond exhausted. One mate, boatswain Black, over a nine-hour period made seven trips between the steamer and brig and rowed an estimated 23 miles in the rough seas. The 487 men remaining on the Central America prepared for the inevitable sinking of the ship. Most mustered into their cork and tin life preservers. They hastened to fashion make-shift rafts from doors, decking, furniture and anything else that could float. Some elected to lock themselves into staterooms, drink copious amounts of alcohol and smoke a final Havana cigar, rather than suffer the fate of the open water. “At this point during the interview Mrs. Cook paused, and it was several minutes before she could proceed. Then she took up the narrative and told how, when safely aboard the brig Marine, she had looked out upon the waste waters and had seen in the gathering dusk of the evening the rocket sent skyward from the deck of the Central America, which told her that the ship was doomed. “Mrs. Cook had prayed that her husband might be spared to her, but when the rocket lighted the heavens she knew that hope would never be realized. She gave a cry in the agony of despair, but at once a hand was laid upon her mouth and further outcry was stifled. “A whispered word in her ear told her she must be brave: not all the survivors aboard knew the significance of the fleeting illumination of the skies, and too crushed and weak to offer protest, she did as she was bidden. “So it was, Mrs. Cook says, that outside the officers of the brig, only two or three aboard the Marine knew that the Central America was just then sinking, carrying with her over 400 brave souls to a grave beneath the storm-tossed waves. It is estimated that the Central America went down about 125 miles east-southeast of Charleston, South Carolina. The force of the hurricane and strong current had blown her over 100 miles off course. 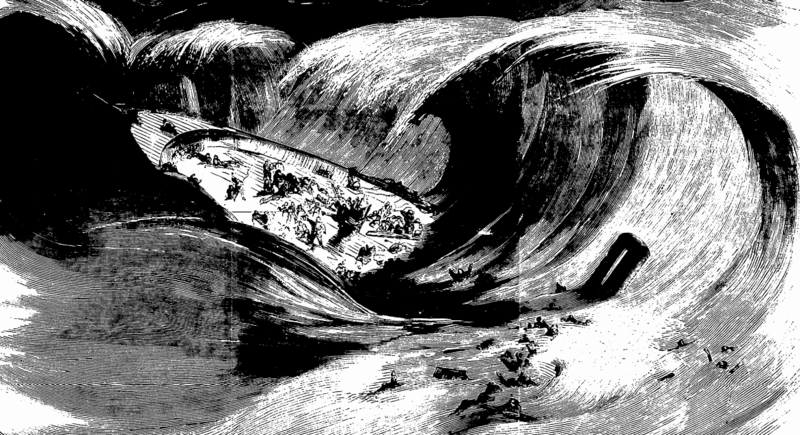 Utter chaos, panic and horror enveloped the men pitched into the sea. Some were killed within the first few minutes: some struck by pieces of broken ship; others entangled in rigging; locked in their staterooms; or sucked deep by the force of the sinking ship. There were others who lost preservers or something to hold onto and could not swim. However, many survived the early aftermath of the sinking; clinging to their preservers and floating debris in the pitch dark. This was different from the conditions that took so many lives when the RMS Titanic was lost in 1912. The air and waters of the North Atlantic were near-freezing during the Titanic disaster, and those in the water were overcome by hyperthermia in a matter of minutes. The Central America went down in the relatively warmer waters of the Atlantic Ocean’s Gulf Stream. The major threats facing those men were: the roiling seas; hanging onto something sturdy; fighting off other men trying to grab them or their piece of wreckage; exhaustion from bailing water from the ship non-stop for almost three full days and nights; and no other boats nearby to rescue them. These factors resulted in a slow death for too many. When they finally lost sight of the brig Marine, hope was all but abandoned. The following detail is by far one of the most strange and remarkable things that occurred in the midst of this unfolding tragedy. The bark Ellen, with Captain Anders Johnsen and a crew of 13 fellow Norwegians, were in route from Honduras with a load of specialty wood bound for Falmouth, England. Their ship encountered the hurricane and broke a mast and lost sails. This story is well told by Normand Klare in his book, The Final Voyage of the SS Central America. At just before 6:00 p.m. Saturday, September 12th, Captain Johnsen stood on the quarter deck with two crew members and the helmsman, when a bird flew around the captain, grazing his right shoulder. It flew around the vessel, then again around his head. When it flew at his face, Johnsen grabbed the unusual bird and held it by the legs. After the bird bit the captain and some of the crew, he had it beheaded and thrown overboard. Jacobsen and the Ellen had steered into the aftermath of the sinking of the Central America only five hours earlier, and saw a mass of men in the water struggling to survive. All because of that frigate-pelican! Minutes before the Central America went down, Fireman Alexander Grant cut away a large portion of the deck as a makeshift raft. He and ten other men clamored on top of the deck after being plunged into the seas. Their combined weight caused it to submerge about a foot. George Dawson, one of the passengers, managed to survive the initial moments by grabbing onto a life preserver and a piece of a gangway plank. They watched the brig Marine drift out of view and, although they were only a few hundred yards away when Captain Johnsen and the Ellen miraculously arrived on the scene, their cries for help were carried away by the wind and unheard. Over the next three days, eight men died and rolled off the deck into the sea. All were nearly wild from hunger, thirst and exhaustion. Dawson finally abandoned his “raft” and climbed on board the deck with Grant, a passenger named John Kinnerly, and one other young man named Frank. Four days after the wreck, although many pieces of the ship were seen, nothing to eat was found. There was no fresh water to drink. They saw small fish around the raft but weren’t able to catch any. Dawson finally clubbed a dog fish with an oar. Grant cut it up but, even though they were starving, it was too tough to eat. After drying it in the sun, they managed to eat a little of it. Frank and Kinnerly died that night. It was now just Grant and Dawson. On Thursday, the fifth day of floating in the sea, Grant spotted a boat. The boat appeared to be about three miles away, but Grant could not tell if anyone was in it. Determined to reach it, he removed all his clothing but his underwear, tied a life-preserver around himself, and – though weak and spent from days without food and water – he struck out, hoping to be able to improve their position and chances for reaching safety. Dawson stayed on the raft. Grant could not remember how long he struggled toward his goal, but as he neared it he saw a man sitting in a boat trying to scull it toward him. As Grant reached the boat, Second Engineer John Tice reached out to help him in, and after a joyful moment of meeting, the two surviving crew members combined efforts to rescue Dawson from the hurricane deck. Dawson stripped off his wet clothes but kept a wet cloth over his head. They left the dead body of Frank lying upon the raft. Dawson, Grant and Tice floated aimlessly for another three days. The eighth night since the wreck brought a heavy rain, and the men were able to finally drink some fresh water. On the morning of the ninth day, Captain Colin Shearer and his crew aboard the bark Mary, hauling a load of molasses and sugar from Cuba to Cork, Ireland, spotted the lifeboat and made way for it. When Grant and Dawson caught sight of the ship, they grasped their oars and began feebly to row; they seemingly had lost all feeling in their emaciated bodies and all three men were not far from death. All told, 101 men and 60 women and children were rescued by the Marine, Ellen and Mary. A total of 435 men perished in the wreck, including Samuel Swan. It is not known how long Sam may have struggled in the sea. God rest all their souls. The brig Marine limped northwest for Norfolk, Virginia. The women and children were squeezed into seven bunks in a cabin no bigger than a good size stateroom. They were ankle deep in water, clothed in soaking rags. Of the 32 women on board, 18 had husbands on the Central America and were worried sick about their fates. Food was scarce. “The women and children aboard made serious inroads in the larder of the little ship, so that for a week each person’s allowance was a small piece of “hard tack” [a biscuit] a quarter of the size of one’s hand, once a day. “Upon this scanty fare depended the life of Mrs. Cook and her baby girl, just taken from the breast. None could foresee how long these conditions would last, and it looked for many weary days that they had escaped drowning only to meet death by starvation. “One day one of the survivors saw Mrs. Cook moisten her hard tack in a cup of water and feed it to her starving little one, while in every line of face and feature of the mother grim hunger was revealed. ”Approaching the mother he tendered his scanty store, begging that it would be accepted. He had a wife and two children in Albany, New York, he said, and if a mother could give her all for her child, he, as a father, could do as much in memory of the little ones he might never see. The crew was exceedingly generous, sharing their clothes, food and fresh water. Still it was barely enough, and after four days everyone was near starvation. Wednesday evening, they encountered another ship, the clipper Euphrasia, Captain William Lanfare commanding, who generously provided the Marine with fresh supplies of food. The Marine made little headway over the next three days due to light winds and the damage suffered by the ship. On Friday, September 18, Captain Burt flagged down the steamship City of Norfolk off Cape Henry. Her commander agreed to tow the Marine into Norfolk, but only after first extorting $500 from the passengers. Captain Johnsen and the Ellen, with the 49 men rescued from the Central America, reached Norfolk a few hours before the Marine. The first news of the disaster was telegraphed from Charleston, Virginia, to New York City on the evening of September 17, and appeared in the morning newspapers the next day. Mary and Lizzie were among the 85 rescued passengers that left the Marine and boarded the more seaworthy Empire City, but not before they handsomely compensated Captain Burt and his crew for their heroic efforts. The Empire City arrived in New York City on Saturday, September 19, one week after the sinking of the Central America. When the passengers received word to go ashore, Mrs. Mary Swan burst into tears and, wringing her hands, wailed: “Where shall I go after I go ashore?” When asked, she said: “No, I have no friend in New York, nor in all the world, now that my husband is lost.” (15) She and other ladies got into carriages, and the hackmen drove them to hotels, refusing to take pay. Tomorrow: Part III. The Rest of Mary’s Remarkable Life. (1) Much of the information in this segment is attributed to the exceptionally well-researched 1992 book by Normand E. Klare, The Final Voyage of the SS Central America 1857. (2) From the interview of Mary Sawyers Cook that appeared in the November 23, 1901, edition of The Sacramento Bee. (3) In 1857 there was no telegraph or cross-country railroad or mail service. It took a month for news from the East Coast to reach California and vice versa. There were 31 states, with only 5 of them west of the Mississippi River: Missouri, Iowa, Arkansas, Texas and California. Total U.S. population was less than 30 million. (4) The Sacramento Bee, Women and Children First, November 23, 1901. (6) Gary Kinder, Ship of Gold in the Deep Blue Sea, Random House, 1998, pages 58-59. (7) The Sacramento Bee, Women and Children First, November 23, 1901. (8) Mary married George M. Cook in 1863. (9) The Sacramento Bee, Women and Children First, November 23, 1901. (10) Victor Audubon, whose father inspired the Audubon Society, identified the strange bird as a frigate-pelican, also known by sailors as the man-of-war. (11) Normand E. Klare, The Final Voyage of the SS Central America, pages 121-126. (12) The Central America went down in the midst of the strong current of the Gulf Stream which, combined with the wind and high seas, likely scattered other survivors far away from those who were fortunate enough to be plucked from the sea by the Ellen. (13) Normand E. Klare, The Final Voyage of the SS Central America, pages 165-176. (14) The Sacramento Bee, Women and Children First, November 23, 1901. (15) The New York Times, September 21, 1857; Baltimore Sun, September 23 1857. Thank you for a great story. I never read this in history books. I enjoyed reading this, but am saddened for the lives lost.